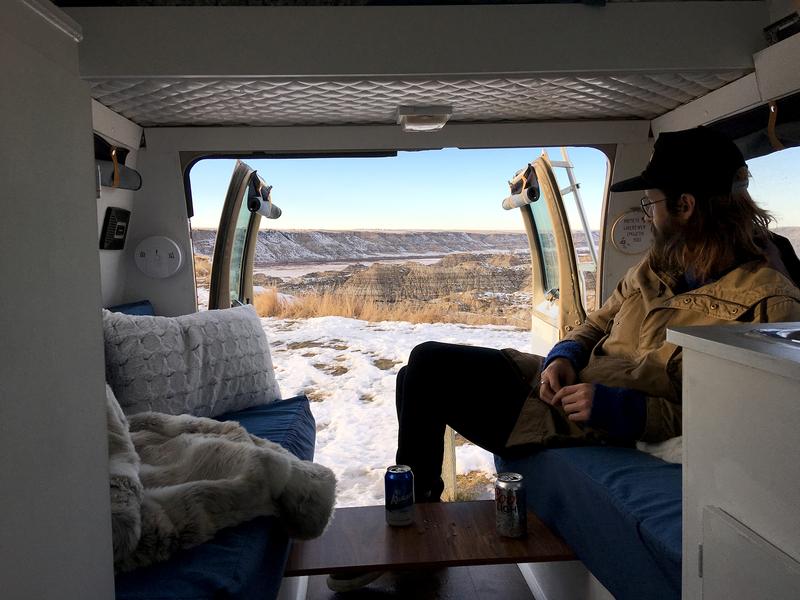 For our first little adventure, we took advantage of one of the first nights where temperatures weren’t severely below freezing and drove about 1.5 hours Northeast of Calgary to a town called Drumheller. 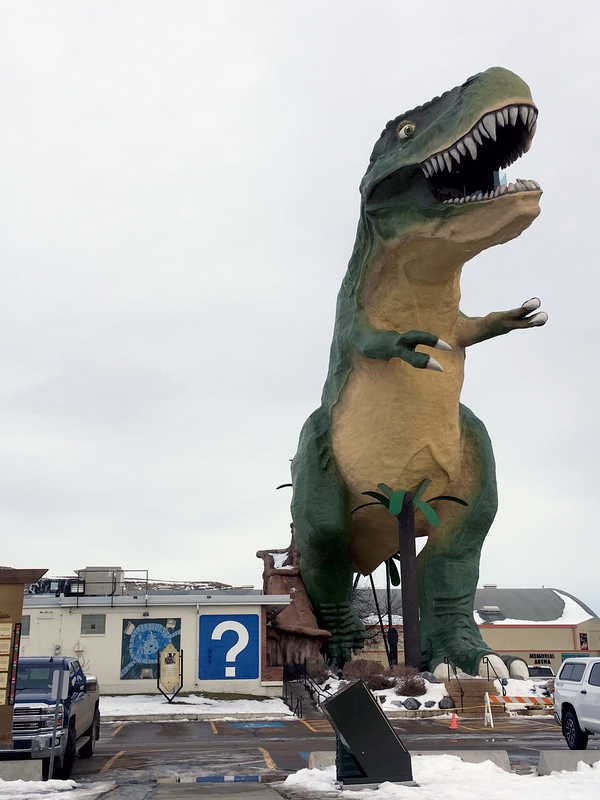 If you like dinosaur statues in various costumes and sizes scattered throughout town, then this is the place for you. In fact, Drumheller boasts the largest dinosaur (model) IN THE WORLD! Now how many people can say they’ve seen that?! Hockey arena for scale…that’s one big dinosaur! We perused the interwebz a little bit before going to see if there were any known good spots to park for the night and came across Horsethief Canyon. The view looked sweet and although Justin lived in Alberta for ten years previously, he had never been there. It’s about a 15 minute drive north of town and apparently coined its name from illegal horse smuggling between Alberta and USA. Juicy. After driving along the Red Deer River, past the Royal Tyrrell Museum of Paleontology (which surprisingly isn’t pronounced “ty-rell”), we were right in the thick of the Badlands. If it weren’t for the lingering snow, the landscape could have passed for Arizona. This was pretty trippy for me, who has only ever visited the Ontario badlands, which look more like rolling red sand dunes than desert canyons. Cracked a beer and we felt like we’re at home. The parking lot was nice and empty. I imagine it’s a popular day trip in the summertime but end of November temperatures left us with the place to ourselves. This was an awesome spot to park the van because it’s quiet and secluded but still within a 15 min drive of town if you need to grab food or take a gas station poop. After getting settled in for the evening, we noticed a weather alert for a windstorm. Some 100 km/h winds would be paying us a visit and they were certainly beginning to make their presence known. We moved the van slightly away from the edge of the canyon where the winds were able to hit us head on, as opposed to from the side like they were while we were eating dinner and rocking like a canoe. My mom later added, “as long as it was just the winds that were rocking the van” …ugh. It was a slightly tumultuous slumber that night as my mind switched on paranoia mode and raced through different outcomes of us falling into the canyon with no one around to notice that we’ve died. I might have gotten a little ahead of myself and forgotten that we weigh over 6000 lbs empty. On that note, the winds died down around 4am and we woke up to a lovely sunrise peaking over the rocky relief. All in all, it was a great first trip and allowed us to really test how the flow of the van is working for us (and how well the furnace works). I think our next trip will be even better! Evening sunset over Dinosaur Valley. If you’re curious to know more about Drumheller or the surrounding Badlands area, pop us a comment or message and let’s chat!